For awhile, Elina from Healthy and Sane and I have been g-chatting about meeting up for dinner and drinks. 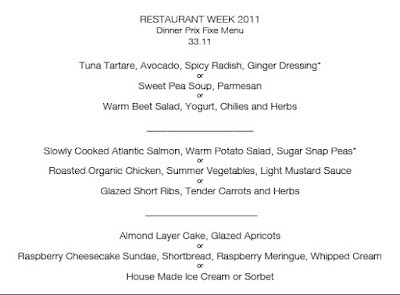 It took awhile but we finally coordinated during Restaurant Week here in Boston. We wanted to keep our party small so we could actually book a table and be able to chat. We invited two of our favorite foodies- Shannon from Tri2Cook and Cara from Caras Cravings. I've never met Cara or Shannon before so I was excited to hang out! We choose Market mainly because I've been dying to try it and Elina had rave reviews! When we sat down, our waiter tried to sell us on some appetizers but we all derailed the idea by telling him we wanted the Restaurant Week Menu. The Sangria was perfectly balanced and tasted fresh and delicious. I'm big into Sangria these days. For the first course, I ordered the Tuna Tartar. My friend Gretchen went to Market earlier in the week and said that the Ginger Dressing overpowered the dish, but I disagreed. I loved this dish and loved the extra sauce. I thought it complimented the raw fish nicely. The crunch of the radishes was also a nice touch. Elina ordered the Sweet Pea Soup and I stole a spoonful. Another great dish, but I'm happy with my choice! The beautiful orange color was a standout. Both Elina and I couldn't resist! Cara ordered the Salmon and Shannon ordered the chicken. Everyone seemed pretty happy with their meals. I devoured every bite and loved my dish. I was so full, I barely had room for dessert. Or so I thought. My dessert was finished in no time! The layers of almond was so satisfying without being too rich or two sweet. The homemade whip-cream and glazed apricots balanced the dish out so well. Shannon and I ordered this dish. Cara and Elina ordered Raspberry Cheesecake Sundae which ended up being Raspberry Cheesecake flavored Ice Cream with Raspberry Sorbet. Tricky! After we paid and were wrapping up dinner, the fire-alarm went off which made the night even more comical. All in all, the four of us enjoyed a fabulous meal that was well balanced and delicious. But the best part of the meal was most definitely spending time with some of my favorite bloggers!! 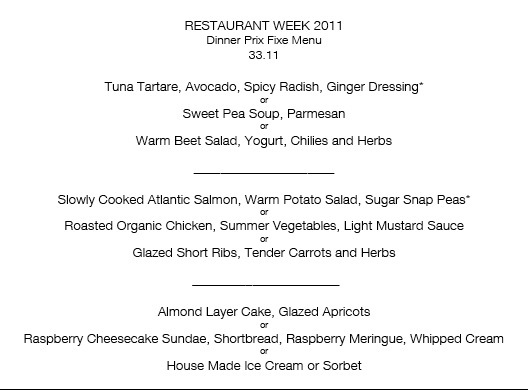 Did you go anywhere fun for Restaurant Week? Link to it in the comments so I can check it out! It's eggplant season and I've been getting my fair share in my CSA from Stillman's Farm. I made a dish that I first saw while pinning that I truly believe should be on every Italian Restaurants appetizer menu. It was THAT good. I mean really... how good do these look? Lightly battered and fried eggplant as the "sandwich bread" with yellow and red heirloom tomatoes, basil, arugula, goat cheese and fresh mozzarella. You really can't go wrong. And I guess you could bake them to make them healthier, but thats no fun, right? Place the flour, eggs and panko in separate bowls or small plate. Dip the eggplant slices in the flour, then eggs and then breadcrumbs. Try to make sure the panko adheres to the eggplant. Heat half the oil in a non stick pan over medium heat. Cook half the eggplant until golden brown and crispy, about 2-4 minutes on each side. Then transfer to a paper towel lined place. Wipe out the skillet and repeat process with oil and eggplant. Then form your "sandwiches." Place one piece of eggplant, arugula, 1 or 2 tomato slices, slices of mozzarella cheese, basil, and goat cheese. Then place another piece of eggplant on top of the stack. Also while pinning, I came across this amazing recipe for Baked Eggplant Burgers. I was led to a site called The Tolerant Vegan. Nikki writes about being vegan but also being human and not beating herself up when she thinks about or craves a piece of cake or cheese. I love her recipes and in the short time I've been reading, I've already made two of her recipes! (I just ate the broccoli burgers for lunch). But back to the eggplant burgers. I changed up a few things but the idea is still the same- roasted eggplant blended together with beans and other vegetables (& Hummus!) and then you bake the hell out of it until it forms into a burger. MMmm... Another great way to use up the insane amount of eggplant I've been getting from my CSA in a non-traditional way. This made about 6 burgers for me and the depth of flavor in these burgers was so impressive. I was certain they were going to be mushy but that couldn't be further from the truth. So if you have lots of eggplant laying around and you're looking to do something different and fun with them, make these burgers... and check out Nikki's blog- you will love it! Roast eggplant by cutting the pieces into circles and brushing it with olive oil. Bake for 10 minutes on each side. Once eggplant is done roasting, turn down the oven to 400 degrees. Place eggplant, onions, beans, pepper, arugula, salt, cumin and creole seasoning with hummus into the food processor and pulse for 15-30 seconds. Pour the mixture into a bowl and stir in the panko. Using your hands, form the burgers into 6 patties or however many your mixture makes. (They will be SUPER sticky!) Place on either a foil lined baking pan or use a silicon sheet and bake for 45 minutes, turning them over halfway through. So when these burgers were finished- they were so TASTY! I loved every bite! And since most of you know that I like to make dinner within 30 minutes, I used my prep ahead method to get these on the table fast. Meaning, I cooked them while we were eating the dinner above. Then I just reheated in the toaster the next night and served them with hummus, tomatoes and a salad with heirloom tomatoes, arugula, basil, and mozzarella cheese! So what do you think? Did I intrigue you to try something fun like this with eggplant? These weeks are flying by. I'm already at CSA Week 9! I know I say this every week, but the amount of produce is getting insane. This doesn't even show everything we got!! Peaches, Green Beans, Tomatoes (5), Corn (4), Cucumbers (too many to count), Broccoli (4), Green Pepper, Arugula, Swiss Chard, Japanese Eggplant, Eggplant, Romaine Lettuce. I still had corn from last week so I KNEW I had to make Joanne's Corn Pesto. It was singing out to me :)! And pretty simple! Cook bacon in large nonstick skillet over medium heat until crisp and brown then transfer to paper towels to drain. Pour off all but 1 tablespoon drippings from skillet. Saute summer squash for a few minutes until cooked through then remove to a plate. Add corn, garlic, 1 1/4 teaspoons coarse salt, and 3/4 teaspoon pepper to drippings in skillet. Sauté over medium-high heat until corn mixture is just tender but not brown, about 4 minutes. Transfer all but 1 1/2 cups corn kernels to small bowl and reserve. Place the rest of the corn mixture into processor. Add 1/2 cup Parmesan and pine nuts. With machine running, add olive oil through feed tube and blend until pesto is almost smooth. Set pesto aside. Cook pasta in large pot of boiling salted water according to package directions. Return pasta to pot. Add corn pesto, reserved corn kernels, and 1/2 cup basil leaves, and add in the summer squash. Toss pasta mixture over medium heat until warmed through, adding reserved pasta cooking liquid by 1/4 cupfuls to thin to desired consistency, 2 to 3 minutes. Season pasta to taste with salt and pepper. Transfer pasta to large shallow bowl. Sprinkle with remaining 1/4 cup basil leaves and reserved bacon. 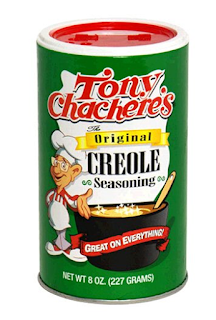 PS- curious what's in creole seasoning? Or don't have it? USE THIS! salt, garlic powder, pepper, cayenne pepper and paprika! I served these cakes with an impulse buy at the grocery store- cajun marinated shrimp skewers FOR $1.50!!! SCORE! Heat oil in a skillet and add corn and zucchini, season with a bit of salt and pepper. Cook for a few minutes until vegetables are soft. Put corn and zucchini in bowl to cool then add the peppers, scallions, eggs, cornmeal, feta cheese and creole seasoning. Stir well. At the same time, clean out your skillet and add another tablespoon or so of either olive oil or canola oil. Form cakes out of the corn mixture and drop them into the hot oil. Cook for about 4 minutes on each side or until lightly browned. I served my cakes along some cajun shrimp skewers! I loved the depth of flavor from these cakes! Some recipes I looked at called for jalapenos, but I always tend to make things too hot when I used jalapenos. 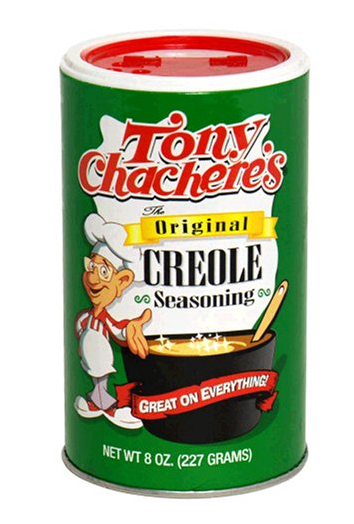 That's why I love Creole Seasoning! It adds the punch without wiping out the rest of the flavors. I wanted to enhance the sweet corn, not hide or ruin it. And it worked! If you are looking for a way to use up your summer corn and you're sick of grilling it, try these recipes out. They were great! What's the most unique way you've used farm fresh corn? Remember a week ago I went to Maine? Well, I'm finally recapping the delicious restaurants we went to and our fun weekend : ) Immediately after I showed up, we headed to Portland Lobster Company so Theodora and I could satisfy our Lobster Roll cravings. Once we ordered we got these nifty buzzers! 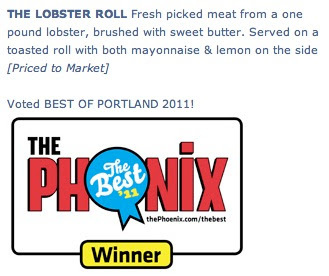 Soon enough we picked up our lobster rolls and they DEFINITELY satisfied our cravings. With my Stonewall Kitchen goodies! We hung out at Pine Point for a few hours before heading home to carbo (and cheese load) in preparation for Sunday's Half Marathon. Here is our pre-race living room shot! If you haven't read the recap of the Freeport Half Marathon, check it out here. Oh and then read Theodora's! And if you've already read them, read them again! Theo broke 2 hours!!! After showering and resting for a bit, we headed to the Front Room in Portland for lunch and scored a nice outside table. I was craving eggs and bacon and this sandwich sang out to me. I switched the blue cheese for goat cheese. It was fabulous! And hit the spot! 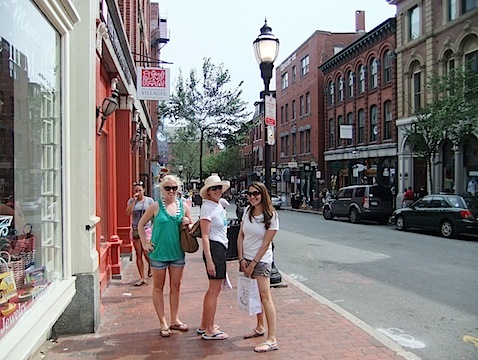 Cannot wait for another trip up to Maine- hopefully it won't be too long. 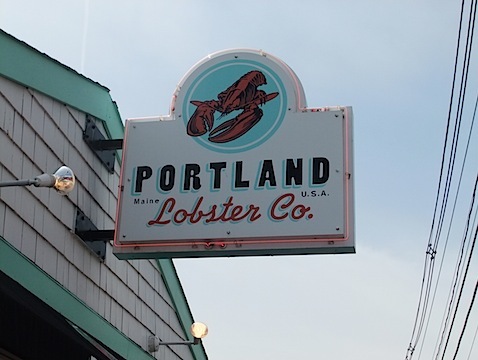 What's your favorite place for a Lobster Roll? The amount of produce I am getting in my half share is pretty amazing. Summer Squash, Blueberries, Arugula, Eggplant, Zucchini, Cucumbers, Lettuce, Corn, Heirloom Tomatoes, Green Pepper, Potatoes, Radishes, and Kale. I was in the mood for an easy dinner so I also picked up a loaf of french bread at the market. When I got home I took 5 ingredients and made it into a delicious sandwich! This sandwich is modeled after my favorite sandwich at Al's Cafe on State Street. Now I don't often buy lunch during the week but when I do, Al's is a staple. Where else can you get Gourmet Subs for $5 in Boston?! Impressive right? Anyway, my favorite sandwich is the State Street Cafe Special. Sounds easy enough right? So I made it at home with fresh arugula instead of basil. I also used hot pepper jelly instead of balsamic because I didn't have any. Dinner done in a flash. Remember how I got some planters the first week of my CSA? Well what I thought was basil turned into peppers. Can someone tell me if my pepper is a red pepper or is going to turn green? I also have SO much Kale and Chives. I need to actually do something with that! Soon, I promise. Oh, and what's that you see in the background? So what else did I make in CSA Week 8? I made Shannon's Zucchini and Kale Lasagna. Only I also used pasta noodles in addition to the zucchini "noodles." Because I don't have a mandoline, I can't slice my zucchini the same and I always get worried it won't stay together. Cheesy vegetarian dinners always win in my book. The next recipe I made was adapted from Kalyn's Chicken Pesto or Pesto Chicken. Whenever I have greens that are starting to wilt, I always make pesto. My swiss chard and kale was starting to look a bit dead so I blanched that and mixed it in the food processor with pine nuts, parmesan cheese, salt and pepper and EVOO. I think I had a couple basil leaves so I threw that in too. I spread the pesto on the bottom of a pan, put my chicken pieces on top and spread more pesto over the top. I then added more parmesan cheese and tomato slices and baked it in the oven at 375 degrees for 30 minutes. Then I sprinkled basil on top. And with this dish I served Whole Roasted Stuffed Eggplant, a recipe I saw on a new blog that I love- Proud Italian Cook. What is this beauty you ask? Well it's a delicious caprese eggplant stuffed with mozzarella cheese, tomatoes and basil. This is simple. All you do is slice up the eggplant- I cut through about 6X. Then you drizzle that with salt, pepper and olive oil and roast in a 400 degree oven until tender. Once it's tender, stuff mozzarella cheese and juicy tomatoes into the eggplant and place back into the oven until the cheese melts. Ummm yes. This was delicious. In hindsight, I probably should have fanned out the eggplant and cut through completely so it gets more tender. Next time I know. Cheesy dinner, served. Delicious indeed. Theodora mentioned that I cook a lot of cheesy meals and that's probably true but I can't help myself. What can I say? Oh right, that's what I can say. 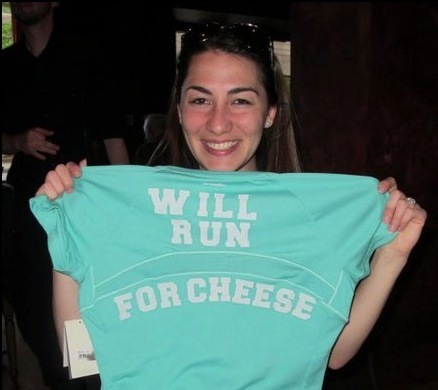 "Will Run for Cheese." YUM. Have you made anything fun with eggplant lately? I got tons more yesterday!